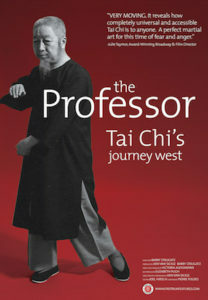 The documentary The Professor: Tai Chi’s Journey West by Barry Strugatz/Ken van Sickle can be warmly recommended. Both Barry Strugatz and Ken van Sickle are themselves practitioners of Taijiquan, the latter being a master Student of Cheng Man Ching himself – their documentary view is thus one from the inside. The work on the film was a journey in itself: it started back in 2002 and the final completion of the project was independently financed by crowdfunding. 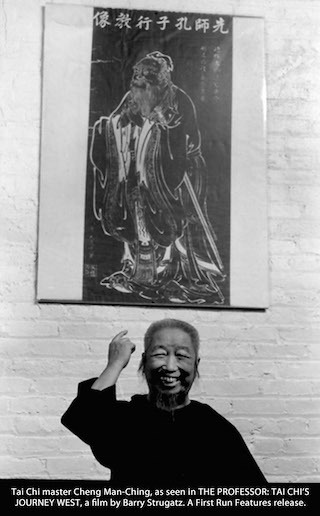 Documenting the late life of Cheng Man Ching the film is set around his teaching life in New York (1964-1975) which in itself provides a strong contrast: Chinese (Confucian) tradition meets the vibrant (hippie) life of the 70s, conservatism meets anarchy. It is therefore a cornerstone documentary for the history of Tai Chi as well as an interesting time portrait of the 70s. Original material from Cheng Man Ching’s classes combined with interviews of his students and children provide a unique view on the late working and teaching of Cheng Man Ching. The original picture and film material, which complements the oral history, is a valuable source highlighting the different aspects of Cheng Man Ching’s proficiency in the Chinese Arts, not only Tai Chi, but also Calligraphy, Painting and Traditional Chinese Medicine. It also gives an insight into Cheng Man Ching’s teaching style: Bridging the gap between East and West, he taught in Chinese (which had to be translated simultaneously by a student) but in a „modernized style“, giving his curious students more explanations and corrections than the traditional Chinese teaching method would allow. An additional combination of showing the different movements, letting the students feel the interaction in pushing hands and commenting and advising them on their pushing hands exercises led to a playful learning athmosphere that portrays Cheng Man Ching as an outstanding teacher personality. Contrary its subtitle, the film is not so much interested in why Cheng Man Ching came to New York in the first place at a late stage in life or in what his motivation was to teach Tai Chi to Westerners. It rather showcases the meaning of Cheng Man Ching and his Tai Chi for his American students in a very intimate way. Cheng Man Ching is still remembered by them warmly and with deep feelings. 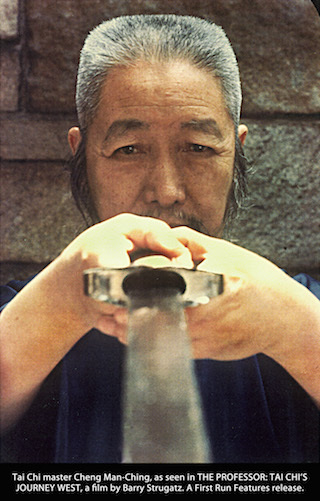 The interviews with his students show that over the years different approaches to his Tai Chi have developed – partly very close to the original teaching and true to the words, partly breathing the essence in a seemingly totally different outward appearance. At this point, where the teacher Cheng Man Ching is protrayed by means of his students’ memories, i.e. through the lens of their connection to him, the film involuntarily changes into a portrait of Cheng Man Ching’s American students. This very interesting second layer of the documentary evokes a picture of an almost magical time, which has had a big impression upon the lifes of many of his students and still continues to make a difference in their lifes till this day. As a Tai Chi addict – be it as a teacher, as a practitioner or as a fan – you would not want to miss this film! Sadly, the only available format of the DVD is NTSC (all regions); there is no PAL version out now. The DVD extras comprise an uncut version of Cheng Man Ching’s 37 movement form. The film is also available as video on demand on iTunes in all English speaking countries and Scandinavia.